21 year old defenceman Thomas McKinnon will no longer join up with the Invicta Dynamos after opting to remain in Canada for 2018/19 whilst the club have secured the signing of backup netminder 18 year old Thomas Adams as an interim measure. Scotsman Thomas McKinnon was to join the Dynamos after four consecutive seasons across the pond in Canada however the blue liner has since opted to take the opportunity to stay the other side of the Atlantic and so will no longer link up with the Mos for the 2018/19 campaign. Speaking on U-turn of Thomas McKinnon, Head Coach Kevin Parrish said, “We are disappointed that Thomas won’t be joining us but he has chosen to remain in Canada and all we can do is wish him well. Thomas is still young and looking to make his mark across the pond”. Meanwhile Head Coach Kevin Parrish has taken action to fill the gap left following netminder Ryan Bainborough’s decision to join a club closer to his home by completing the signing of 18 year old shot stopper Thomas Adams. 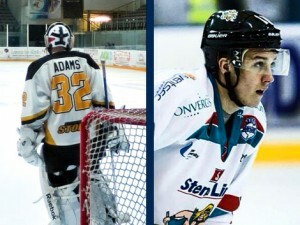 Adams has previously played in Milton Keynes and with Haringey and will feature for the Mos as backup for Adam Long. On the signing of Thomas Adams Parrish said, “Thomas is a promising young netminder who has been good enough to agree to come in and provide cover for Adam Long in the short term. I am pleased to welcome him to the team and look forward to working with him. Work is ongoing with a view to securing a full time shot stopper but Thomas comes in to help us out and prevent us being exposed”. The Invicta Dynamos are next in action on Sunday 23rd September as they hit the road to face the London Raiders in their first competitive away fixture of 2018/19.